The current sign was erected in 2012 to mark the Diamond Jubilee of Queen Elizabeth II. It depicts the four Greens of Cratfield; Bell Green, Silverleys Green, North Green and Swan Green. The design of the new sign is based on that of the original one erected in 1977 to commemorate the Silver Jubilee and was carved for the village by an enthusiastic group from the Essex branch of the British Woodcarving Association. 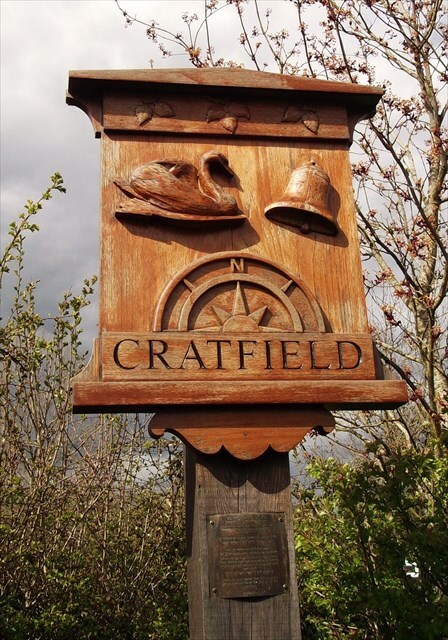 They came to Cratfield twice a year to spend a week carving, obtaining their inspiration from the Suffolk countryside. On being approached, they very generously offered their skills to carve a new sign without charge, being very pleased and proud to have been asked. Cratfield is a small farming/residential village tucked away in the North Suffolk countryside south of the town of Halesworth. The village has no shop and the public house has recently closed down. The grade I listed church St Mary's, is flint of construction in the perpendicular style with parts dating back to the 14C. There is a convenient parking area outside the church if you wish to walk through the vilage and/or tackle other close by caches or you can park on the main road Bell Green.